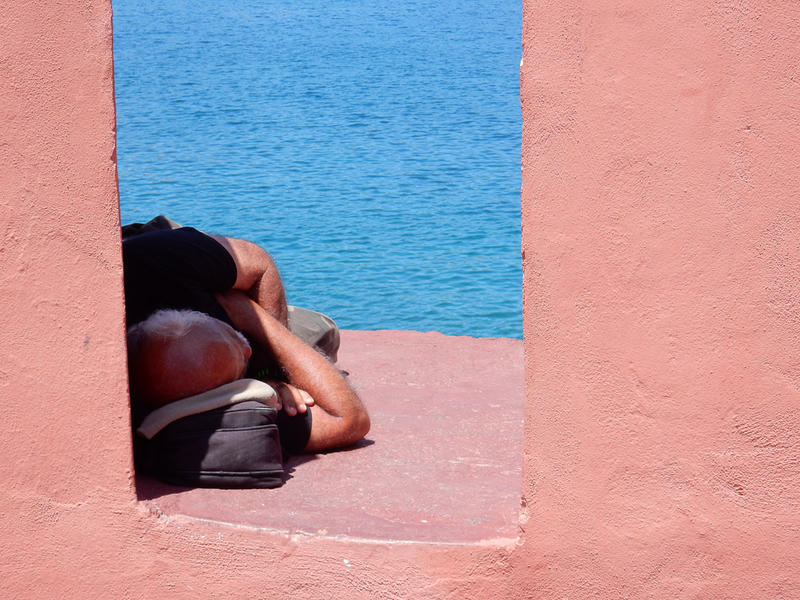 It’s been four weeks now since we left Carloforte, Sardinia. We are currently at “Base Nautica Flavio Gioia”, a lovely little marina in the small city of Gaeta on the west coast of mainland Italy, about halfway between Rome and Naples. The town is quite a bit bigger than Carloforte, roughly 20,000 residents as opposed to Carloforte’s 5,000, but it is still small and charming and we are enjoying it so much that we have delayed our departure. We left Carloforte on June 3 to anchor at the southern end of Isola San Pietro, the island where Carloforte is located. The next day (June 4) we sailed east along the southern part of Sardinia, and met up with our sailing friends Hajo and Julia from S/V Serafine, another Amel Super Maramu, in Porto Pino, one of our favorite anchorages in Sardinia. Porto Pino is great, but can be very uncomfortable if there is any swell coming from the south or southeast. 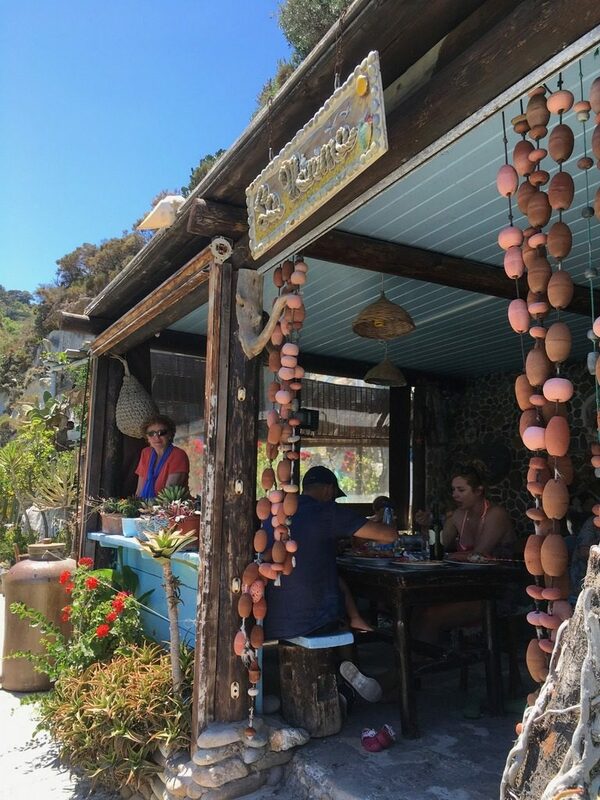 After we arrived we had enough time there to enjoy a beautiful walk along the white sand beach with our friends, and to have dinner at a great seafood restaurant that we had enjoyed many times in the previous year, the Blue Marlin. Unfortunately, on our second night there, a very strong swell came into the anchorage just after sunset and after rocking and rolling uncomfortably at anchor all night, we decided we had to move on. Our next destination (on June 6) on our trip east was the anchorage at Porto Giunco on the east side of Capo Carbonara, just at the most southeastern tip of Sardinia. We had a hitchhiker with us for the short (55 nm) trip… a fit Sicilian man named Salvatore. 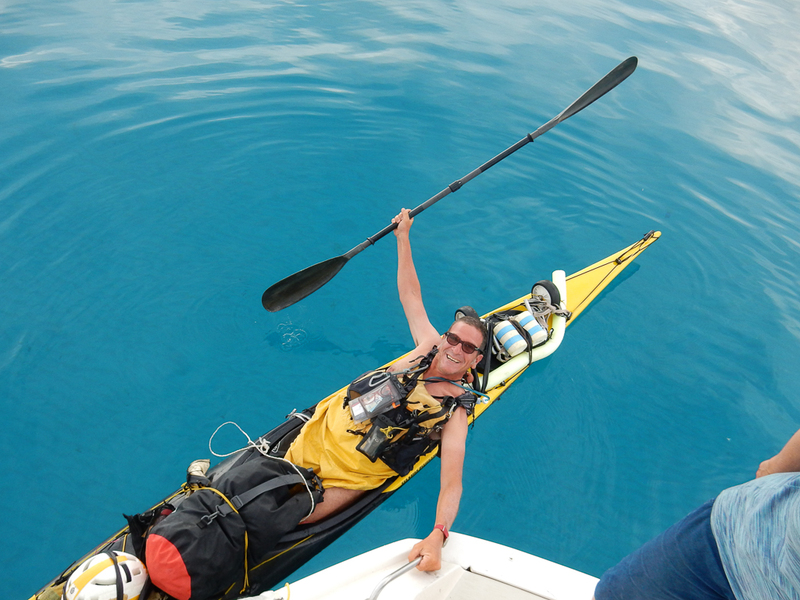 Salvatore is an interesting guy who likes to spend his vacations ocean kayaking in various places around Italy as well as traveling extensively around the world. He needed to get back to work in Palermo in a few days but was unwilling to paddle into the large swells that had suddenly arrived in southwestern Sardinia. Nor could he wait them out if he was going to get his kayak back to the ferry in Cagliari in time. So he paddled up to us and asked if we could tow his kayak (loaded with lots of very well packed supplies) and bring him onboard for the day’s trip. Once we moved away from the southwest corner of Sardinia the swells became less pronounced and we mixed sailing and motoring for the trip of about 10 hours. 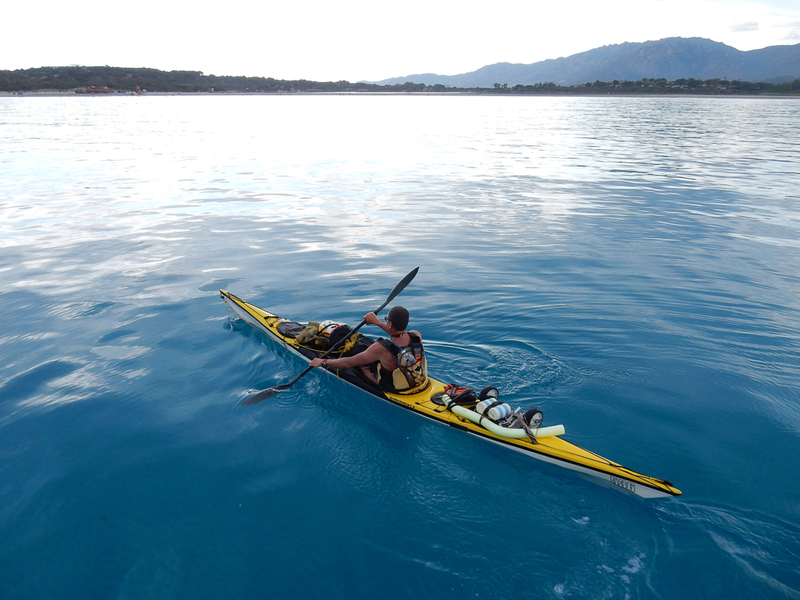 As soon as we dropped anchor in pretty Porto Giunco, Salvatore hopped off into his kayak and paddled off. The next day we did our first big crossing of the year. 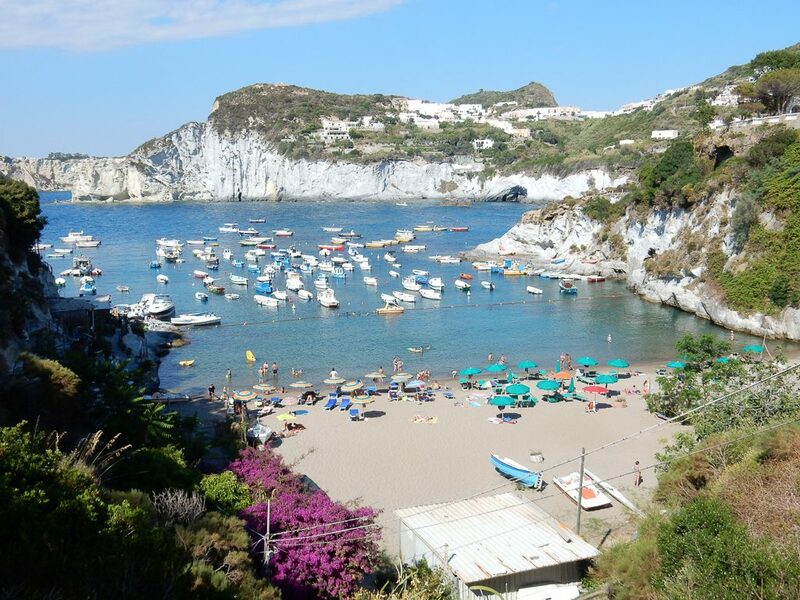 A 200 nm sail across the Tyrrhenian Sea to Isola Ponza, a small island just off mainland Italy. 200 nautical miles is not a particularly long sail for us, but it was the first overnight sail of the season which is always a little anxiety producing, at least for me (L.). We also were aware that the Tyrrhennian Sea has a reputation for being rough so we were trying to cross with good conditions. The weather forecast looked perfect, with strong winds forecast, but from the right direction to get us where we wanted to go in a hurry. Winds were supposed to be moving around quite a bit, but were predicted to be coming primarily from the northwest, and we were headed northeast, which should have been perfect. The first several hours of the passage were great…. perfect wind and comfortable seas as the island of Sardinia blocked the potential swell for many hours. After an afternoon lull in the winds where we motored along comfortably with flat seas, a big, uncomfortable swell started building from the north, and the winds started picking up on the nose. Just before sunset, the winds finally switched around enough that we could set our sails again. Just after pulling out the mainsail, we heard a loud noise, and saw that the main halyard had snapped, and our mainsail was stuck while sliding down the mast. Mark had to go up on the deck and wrestle down the sail. It ordinarily would not have been too bad except that the boat rolled badly from side to side from the steep seas. Mark had to hang on tightly with one hand while trying to gather up the sail with the other, and got quite seasick working on deck. He had to cut away the various lashings of the sail since untying them was impossible with the roll. 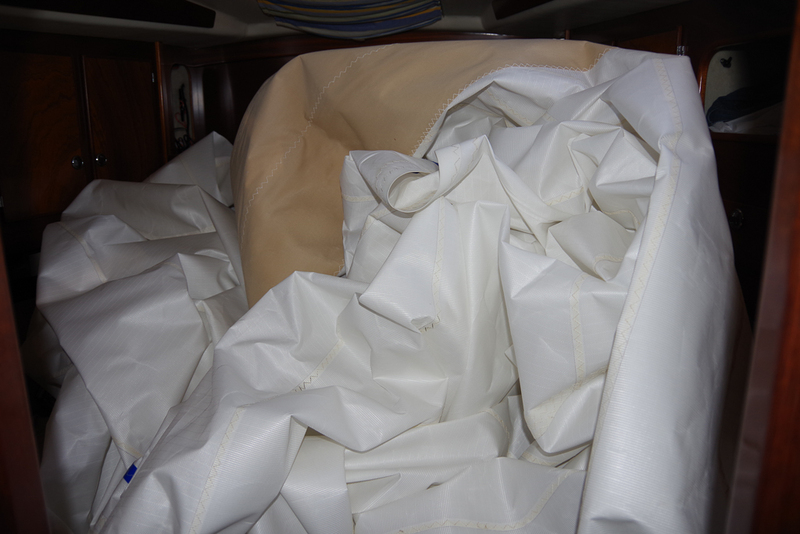 We managed to get the sail off (dry) and dragged the whole bulky mess down below and stuffed it into the forward cabin. Fortunately, Sabbatical III is a ketch so we could continue sailing with just the jib and mizzen. It was a long, uncomfortable night with very large seas and wind over 30 knots plus the added distraction of a continuous loud clanging sound as the now loose main sail furler (roller) constantly banged inside the mast. It was a pretty unnerving sound, but there was nothing to be done until morning. By mid-day (June 8) we had reached our anchorage in Ponza, and still rattling and clanging away, we dropped our anchor. Within an hour Mark had used the spinnaker halyard to rig up some spare lines inside the mast just to stop the clanging. 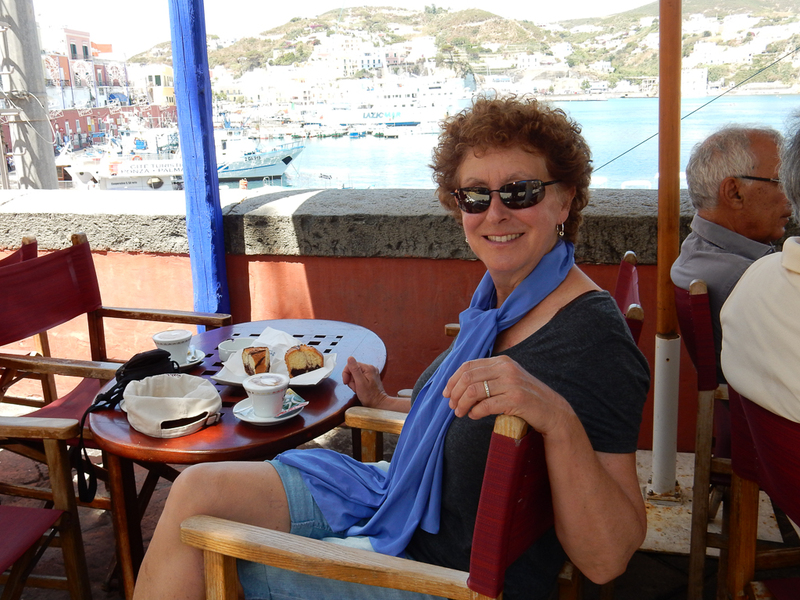 After a few hours of sleep we were ready to start enjoying our time in Ponza. 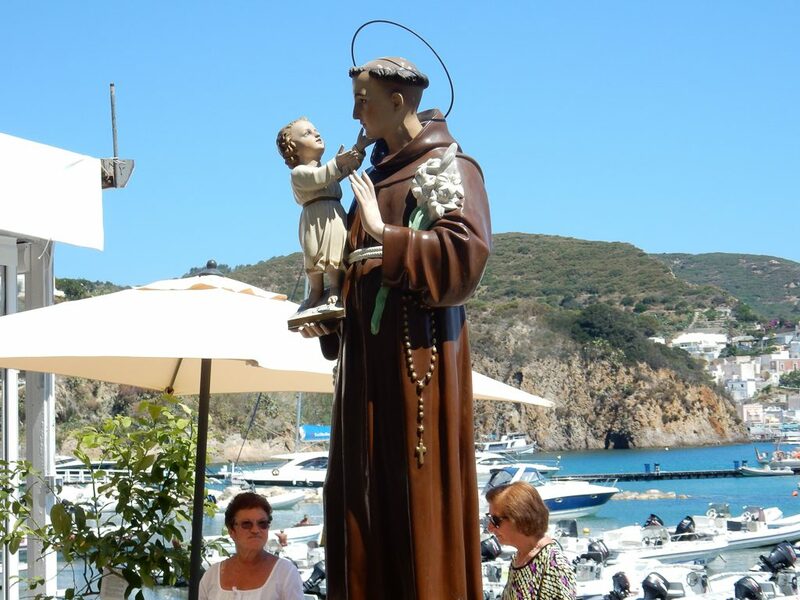 Ponza turned out to be a delightful island. 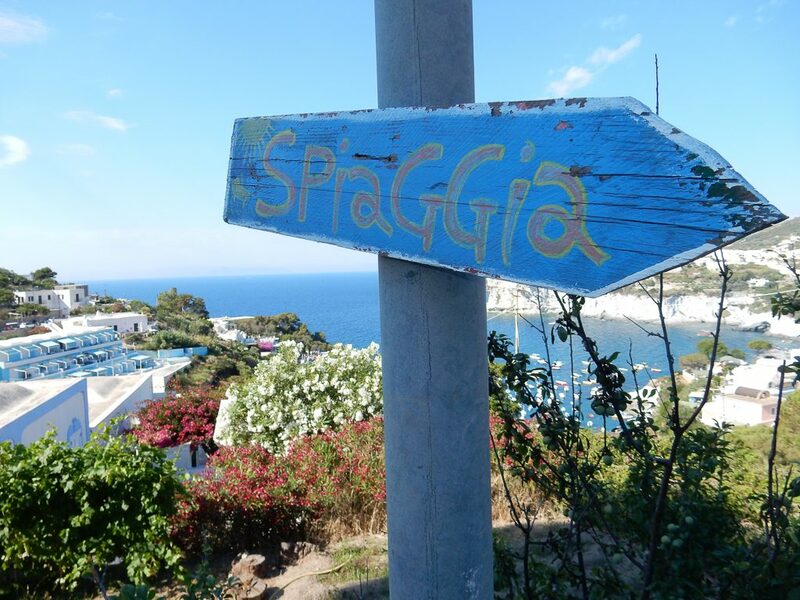 The town is small and cute, packed with all the things we love about Italy… great fruit and vegetable stands, wonderful coffee shops, good restaurants, nice walks, clean water for swimming and a pretty and quiet anchorage protected from swell from the west and north. We happened to arrive just at the beginning of the ten day long celebration in honor of the patron saint of the island, San Silverio. 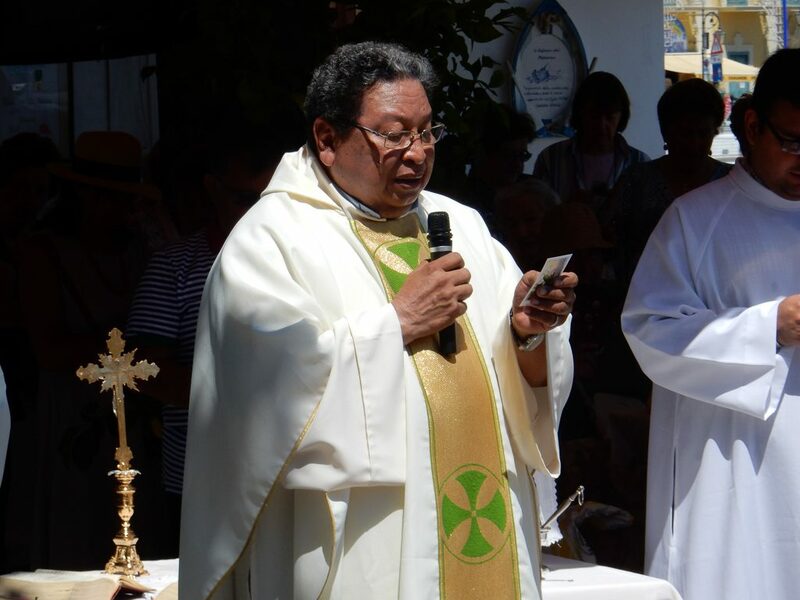 The celebrations began at midnight on the first day where there was a huge fireworks display, followed by a colorful flotilla of brightly lit boats bringing artifacts to the church located above the anchorage. There was also apparently a procession of townspeople to the church, but we could not see that from where our boat was sitting. Each day at noon, they set off a few fireworks and there were some religious activities going on in the churches as well. 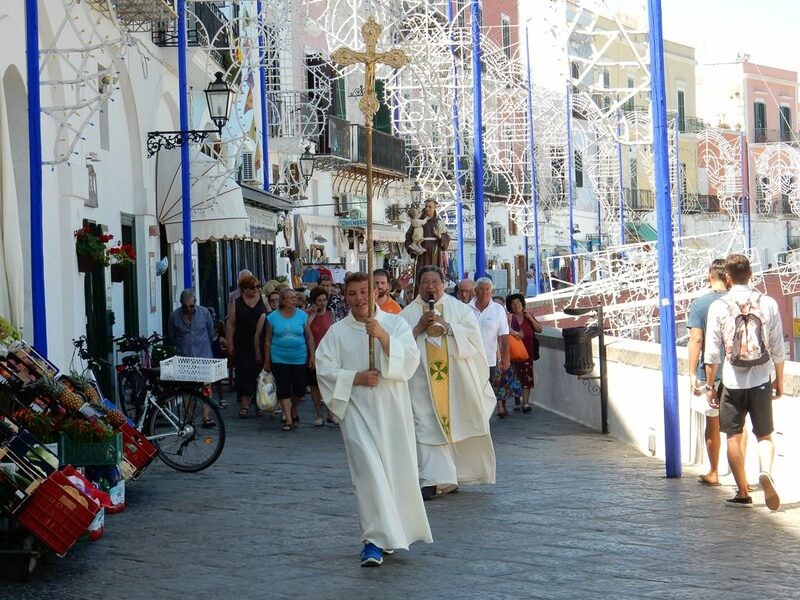 The town was decorated with lights and processions led by priests went through the streets. 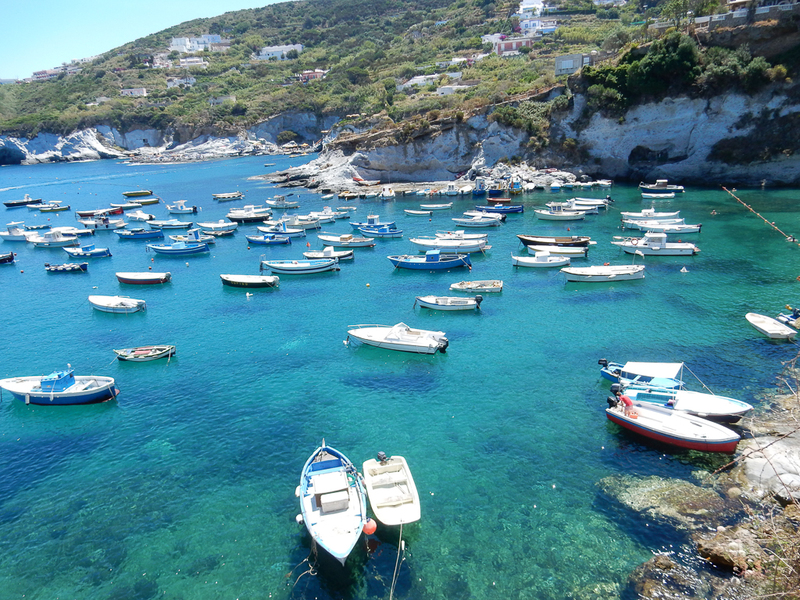 Small boats at Cala Feola, Ponza Island. We took the bus to this beach and had a great lunch. 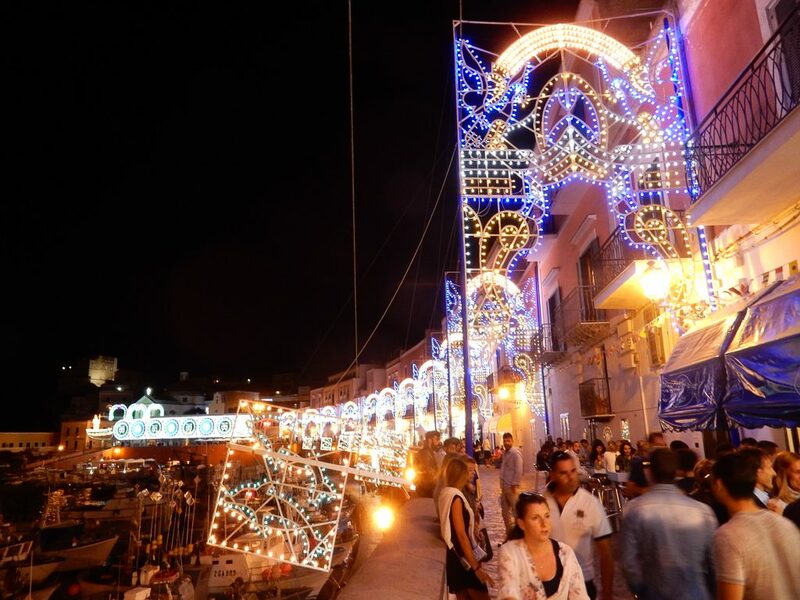 Restaurants are very expensive in Ponza but we found a terrific gastronomia that prepared some of the best food we have had in Italy. We went four times and brought home wonderful food for dinner…. veal, lamb, chicken, potatoes and other perfectly marinated and roasted delights. It was a whole lot cheaper than eating at the restaurants and a lot of fun. During the week the main harbor was pretty empty, but on the weekend, all of the docks were jam packed with visiting yachts. We did not stay in the main harbor, but in the adjacent anchorage (in front of Frontone Beach) which was convenient and perfect for swimming. There were quite a lot of boats in our anchorage as well, but everyone anchored well and at safe distances from each other. I wonder if it is the same thing in July and August when there are three times as many boats? I guess we will see. We sailed over to the nearby island of Palmarola (June 13) as someone had told us that we had to go there to see a spectacular sunset. We found the anchoring there to be a bit iffy, as the bottom is just rock with small areas of hard sand. Our anchor was jammed under a rock, rather than being dug into the sand. We normally would not stay in an anchorage like that, but the wind forecast was light enough and there were so few other boats around that we decided to stay. It was a gorgeous place and we had a great swim and enjoyed the sunset. 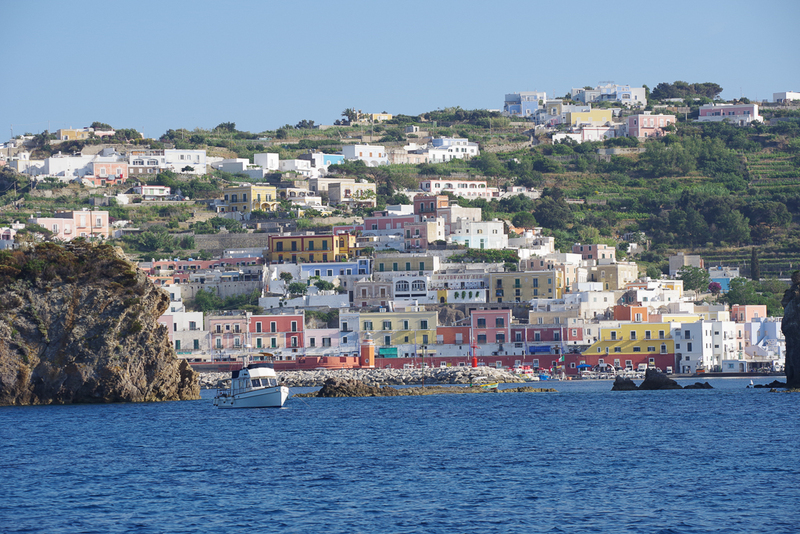 The next afternoon it started to get rolly so we headed back to Ponza where there was more protection from the swell. Mark closely watches the weather forecasts and he could see that a big easterly was brewing for the coming weekend, and the anchorages in Ponza are totally unprotected from that direction. 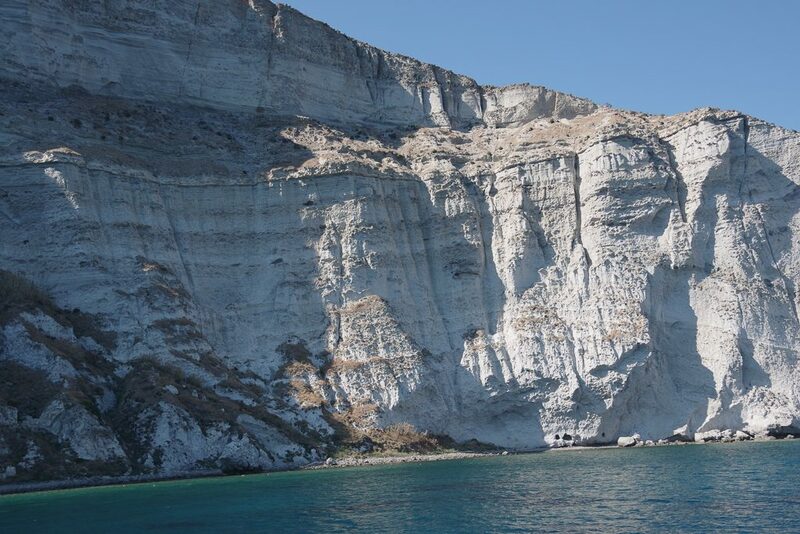 On Friday, June 16th we left Ponza and sailed to Gaeta (about 35 nm). Since there are no anchorages with protection from the east in this part of Italy, we thought it would be better to be at a marina. Plus we needed to get a new halyard. That easterly turned out to be an unusually late and powerful winter storm and Sabbatical III came close to suffering serious damage even while berthed in a marina. More on that later.